The purpose of this book is to analyse the formation of water policy in an international comparative approach to water conflicts in the Americas (USA, Mexico, Brazil, Peru, Bolivia). 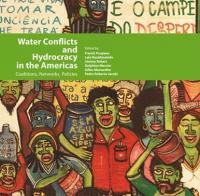 It aims to understand how struggles for water tend to structure coalitions, which, in turn, influence policy-making. Conflicts can be related to different issues: augmentation of water prices, installation of a new water catchment system, negotiations of new commissioning contracts, promotion of municipal plans for water delivery, etc. They impact local orders that are embedded at multiple levels of stakes and social practices (territorial, national, international), especially when a general water crisis (like the contemporary droughts in the USA or in Brazil) involves most of the environmental and political institutions. Consequently, the necessity to take into account this multi‑level dimension of water conflicts implies to explore a new framework of analysis. Network analysis is used as a method to understand the relations between the formation of coalitions, the characteristics of the water managers and the implementation of specific water policy instruments. Edusp – University of São Paulo Press, 2018.